Join us in Chapel Hill for a special homecoming celebration on Feb. 19 and 20, 2016. 2:30 p.m. to 5: 30 p.m.: Spend the afternoon honing your skills in both alumni- and student-led workshops at the Freedom Forum conference room at the UNC School of Media and Journalism. 5:30 p.m.: In the evening, join us for a tour of the recently-revamped Daily Tar Heel office, located at 151 E. Rosemary Street. This will be followed by a happy hour at Linda’s Bar & Grill. 9:15 a.m. to 12:30 p.m.: Saturday morning, there will be additional workshops and professional development opportunities. This will be an excellent chance to meet and work with current DTH students. Here is a more detailed schedule of speakers. The Tar Heels will play the Miami Hurricanes at 1 pm at the Dean Smith Center; buy tickets here. DTH alumni will also gather at Hickory Tavern to watch the game. The main event!! 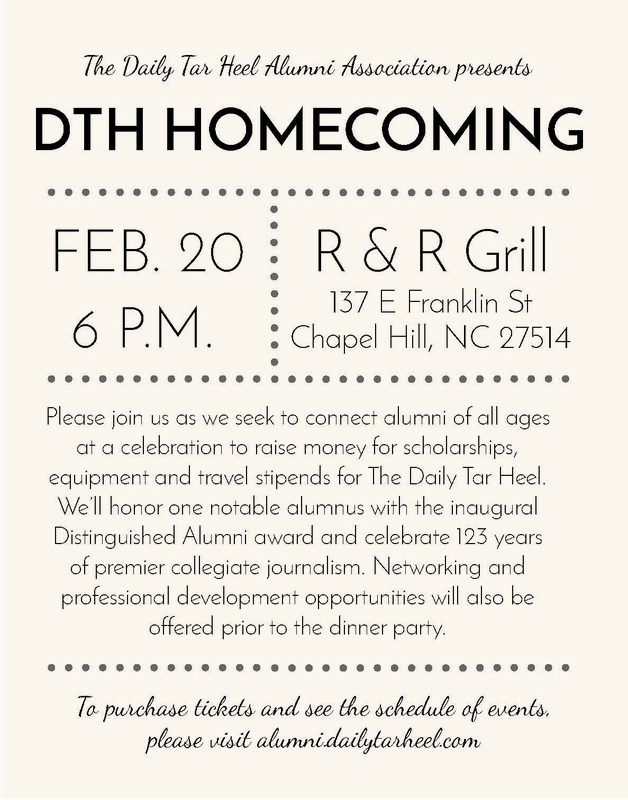 At 6 pm, join us for a dinner party at R&R Grill to reconnect with alumni of all ages at a celebration to raise money for scholarships, equipment and travel stipends for the Daily Tar Heel. We will give the inaugural Distinguished Alumni Award. For more information or to volunteer to lead a workshop, email alumni@dailytarheel.com. Register now to reserve space at this special celebration for the Daily Tar Heel’s 123rd birthday. Tickets are on sale now for $50 an individual and $90 for a couple. The reservation form also provides an opportunity for you make a donation to the DTH if you cannot attend the homecoming.